To Cite: Moradi-Tabriz H, Motevalli D, Pourrashidi Boshrabadi A, Mahdavi A, Eftekhar-Javadi A. Intradural Intramedullary Spinal Hydatid Cyst Mimicking Cystic Malignancy: A Case Report, Arch Clin Infect Dis. 2018 ; 13(3):e62365. doi: 10.5812/archcid.62365. Primary spinal hydatid cyst is considered as a very rare form of hydatid disease, which accounts for less than 0.5% to 1% of hydatid disease cases. Intramedullary hydatid cyst is extremely rare. Herein, the researchers reported on a 23 - year - old male patient, who presented neck pain for 1.5 month and numbness of the right upper and lower extremities as well as ipsilateral disturbance in temperature sensation (Brown - Sequard syndrome) since two weeks prior to this hospital admission. Magnetic resonance imaging of cervical vertebrae revealed a 21 × 14 mm cystic intramedullary mass lesion with faint rim enhancement at C3 to C4 level with adjacent edema (Figure 1). Surgical resection was done and pathologic evaluation of the specimen was in favor of hydatid cyst disease, and the patient was treated with postoperative anthelmintic chemotherapy. Hydatid cyst or Hydatidosis is regarded as the larval phase (metacestodes) of the Echinococcus granulosus. Echinococcus granulosus is a major cause of cystic echinococcosis in humans and it has the tendency to involve various body organs. 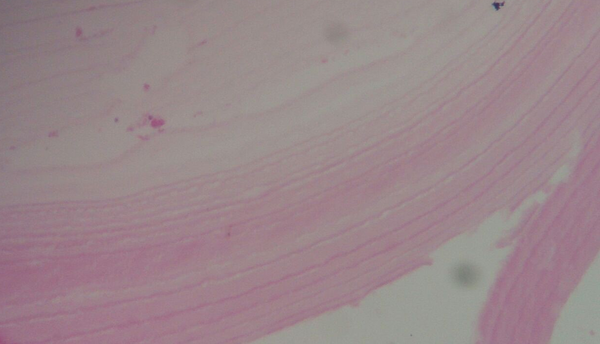 Adult tapeworm lives in the intestine of carnivores as final hosts and the development of larval phase (metacestodes) occurs in herbivores, including humans (intermediate hosts) following ingestion of eggs shed in the feces of the infected carnivores (1). Liver and lung are the most common sites of involvement yet sometimes hydatid cysts can target unusual areas of the body. Although rare, yet the Central Nervous System (CNS) is the most frequently involved organ among the mentioned unusual body sites (2). Herein, the current paper reports an unusual case of intradural intramedullary hydatid cyst of the cervical spine that presented with Brown - Sequard syndrome in an endemic area for hydatid cyst. The patient was a 23 - year - old male, who had complaints of gradually increasing pain in the posterior region of the neck for 45 days that further progressed to weakness, spasticity, and numbness of right upper and lower extremities since two weeks prior to his hospital admission. He also complained of pain and temperature sensation problems in the left side of his body. Sphincter or gait disturbance was absent. He ignored any history of neck trauma. The patient did not mention any diseases in his past history. On physical examination, he was alert and conscious without problems in walking. Right sided hyperreflexia and right sided hemiparesis was detected and Hoffmann’s reflex was positive. Decreasing in pain and temperature sensation were detected on his left side. Gait was normal. Laboratory data, including complete blood count (CBC), liver function tests, and renal function tests were unremarkable. Cervical spinal MRI showed a 21 × 14 mm cystic intramedullary mass lesion with faint rim enhancement at C3 - C4 level with adjacent edema. Other evaluations, including Brain MRI, thoracic spine MRI, lumbosacral MRI, abdominopelvic sonography, and chest X - ray were normal. Electrodiagnostic studies (EMG/NCV) revealed early involvement of the right C4 to C6 roots, with no sign of active denervation (Polyphasic motor unit action potentials and decreased requirement). Chronic mild bilateral C8 - T1 roots lesion with no sign of active denervation was also identified. The patient was a candidate for operation. Careful puncture and microscopic aspiration of cyst contents was done. After this procedure, the condition of the patient alleviated significantly yet after two months, he presented recurrence of the same symptoms, thus, surgery was performed for the second time and en-bloc removal of the cyst was done. The specimen was sent for pathology diagnosis, which consisted of multiple fragments of soft white tan cystic wall tissue. Microscopic study revealed portion of cyst wall with heavy infiltration of lymphoplasma cells and giant cell reaction containing lamellated hyalinized material. No scolex was seen in multiple sections examined (Figure 2). The patient was advised to consume 800 mg of albendazole during the day. After three months, symptoms of the patient gradually improved with no further recurrence. Hydatid cyst is regarded as a zoonotic parasitic infestation, which can be produced more commonly by E. granulosus as a common form and rarely by Echinococcus multilocularis as the alveolar form. The prognosis of the latter is poor with almost 100% mortality and usually presents as unencapsulated, porous, and necrotic mass (3, 4). Hydatid cyst can involve almost every organ of the body (2). Involvement of cervical cord with hydtid cyst is extremely rare. Description of the first case of echinococcosis affecting the spine was coined by Churrier in 1807 (5, 6). To the best of the author’s knowledge, only three cases of intramedullary hydatid cyst have been reported in the current literature (7, 8). Senol et al. reported on a 55 - year - old female patient, who had cervical intramedullary hydatid cyst, and there were also multiple cysts in her liver, spleen, and lungs, which were successfully removed by surgery yet her cervical intramedullary hydatid cyst was not operated due to high risk location, thus, the patient’s follow up was done regularly (8). This is the first report of primary involvement of cervical cord by hydatid cyst. On second admission, precise evaluation showed no liver and lung involvement yet in the follow-up period (after three months), a cystic lesion was seen via abdominal sonography that was highly suspicious to be a hydatid cyst. Hydatid cyst involves the vertebral column in 0.2% to 1% of patients and spinal involvement is reported in about 45% of cases (9). According to a research by Braithwaite and Lees, spinal hydatid cysts have been categorized in five types: Intramedullary, intradural - extramedullary, extradural, and hydatid cysts of vertebra and paravertebral area with extension to spinal structures. The first three types are rare yet the last two are more common (10). A combination of the mentioned types, such as extensive spinal involvement, including bony parts of the spine and extramedullary and intramedullary spine, has also been reported in the literature (11). There is no pathognomonic sign or symptom for spinal hydatid cyst, and patients mostly refer with compression - related symptoms, e.g. radiculopathy, myelopathy, local pain, and pathologic fractures. Diagnosis of hydatid cyst can be made if the patient originates from or has travelled to an endemic region. Serological and radiological tests are extremely helpful in diagnosis. Nowadays, specific ELISA/Western blot serology is about 80% to 100% specific and 88% to 96% sensitive in hepatic hydatid cyst infections yet it is less sensitive in other organs (25% to 56%), which makes the diagnosis even more challenging (4). Differential diagnosis of intramedullary cystic lesions includes cystic astrocytoma, ependymoma, hematoma, arachnoid cyst, and epidermoid cyst (12). Surgical excision for prompt neural decompression plus adjuvant anthelmintic therapy is the treatment of choice for its management (13). Recommended anthelmintic therapy for hydatidosis is albendazole 400 mg twice daily for 28 days, which can pre-operatively decrease cyst pressure as well as preventing recurrence of hydatosis. Post-operation repeating of anthelmintic therapy for one year is also recommended to avoid further relapses (14, 15). Cyst puncture and aspiration of contents with extirpation of cyst wall can be helpful when complete cyst removal is not feasible (13). Prevention and control of human cystic echinococcosis is the best way to reduce its burden in regional endemic areas. This can be achieved in several ways, including deworming dogs, promoting public education, meat inspection, and early diagnosis and proper follow-up of the affected patients (16). In conclusion, although rare, yet hydatid cyst should be considered in the differential diagnosis of cystic lesions of the spine in endemic areas even in the absence of positive serological tests. 1. da Silva AM. Human Echinococcosis: A Neglected Disease. Gastroenterol Res Pract. 2010;2010:1-9. doi: 10.1155/2010/583297. 2. Geramizadeh B. Unusual locations of the hydatid cyst: a review from iran. Iran J Med Sci. 2013;38(1):2-14. [PubMed: 23645952]. [PubMed Central: PMC3642939]. 3. Karakasli A, Yilmaz M, Mucuoglu AO, Yurt A. A large primary dumbbell hydatid cyst causing neural foraminal widening of the thoracic spine: A case report and literature review. Int J Surg Case Rep. 2015;8C:55-8. doi: 10.1016/j.ijscr.2014.12.036. [PubMed: 25625491]. [PubMed Central: PMC4353951]. 4. Karadereler S, Orakdogen M, Kilic K, Ozdogan C. Primary spinal extradural hydatid cyst in a child: case report and review of the literature. Eur Spine J. 2002;11(5):500-3. doi: 10.1007/s00586-002-0411-0. [PubMed: 12384760]. [PubMed Central: PMC3611320]. 5. Gopal N, Chauhan S, Yogesh N. Primary spinal extradural hydatid cyst causing spinal cord compression. Indian J Orthop. 2007;41(1):76-8. doi: 10.4103/0019-5413.30531. [PubMed: 21124688]. [PubMed Central: PMC2981901]. 6. Rayport M, Wisoff HS, Zaiman H. Vertebral Echinococcosis: Report of Case of Surgical and Biological Therapy with Review of the Literature. J Neurosurg. 1964;21:647-59. doi: 10.3171/jns.1964.21.8.0647. [PubMed: 14197093]. 7. Ley AJ, Marti A. Intramedullary hydatid cyst. Case report. J Neurosurg. 1970;33(4):457-9. doi: 10.3171/jns.1970.33.4.0457. [PubMed: 5471936]. 8. Senol MG, Tekeli H, Kendirli MT, Kaya S, Turhan V, Sonmez G, et al. Intramedullary hydatid cyst of the cervical spine. Indian J Med Microbiol. 2012;30(4):480-1. doi: 10.4103/0255-0857.103780. [PubMed: 23183479]. 9. Neumayr A, Tamarozzi F, Goblirsch S, Blum J, Brunetti E. Spinal cystic echinococcosis--a systematic analysis and review of the literature: part 1. Epidemiology and anatomy. PLoS Negl Trop Dis. 2013;7(9). e2450. doi: 10.1371/journal.pntd.0002450. [PubMed: 24086783]. [PubMed Central: PMC3783062]. 10. Braithwaite PA, Lees RF. Vertebral hydatid disease: radiological assessment. Radiology. 1981;140(3):763-6. doi: 10.1148/radiology.140.3.7280247. [PubMed: 7280247]. 11. Prabhakar MM, Acharya AJ, Modi DR, Jadav B. Spinal hydatid disease: a case series. J Spinal Cord Med. 2005;28(5):426-31. [PubMed: 16869090]. [PubMed Central: PMC1808269]. 12. 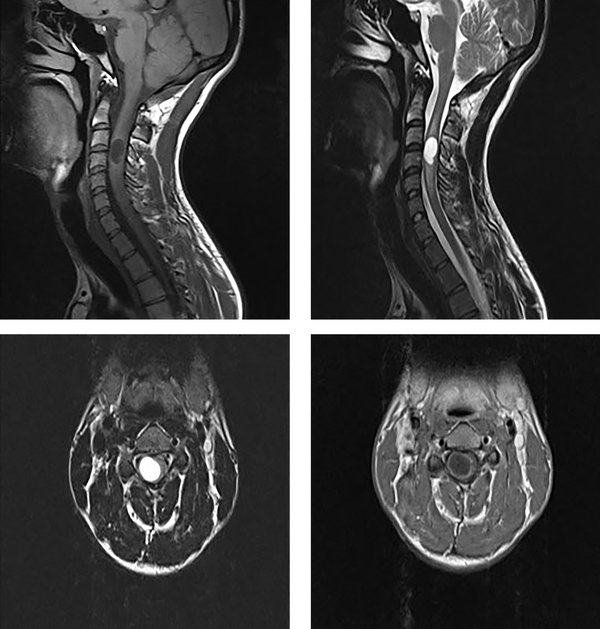 Guzel A, Tatli M, Yilmaz F, Bavbek M. Unusual presentation of cervical spinal intramedullary arachnoid cyst in childhood: case report and review of the literature. Pediatr Neurosurg. 2007;43(1):50-3. doi: 10.1159/000097527. [PubMed: 17190990]. 13. Altinors N, Bavbek M, Caner HH, Erdogan B. Central nervous system hydatidosis in Turkey: a cooperative study and literature survey analysis of 458 cases. J Neurosurg. 2000;93(1):1-8. doi: 10.3171/jns.2000.93.1.0001. [PubMed: 10883898]. 14. Patel D, Shukla D. Back bugged: A case of sacral hydatid cyst. J Neurosci Rural Pract. 2010;1(1):43-5. doi: 10.4103/0976-3147.63104. [PubMed: 21799621]. [PubMed Central: PMC3137835]. 15. Shoar S, Shoar N, Ketabchi SE. Relapsing Primary Spinal Cord Hydatid Cyst: A Case Report and Review of Literature. J Pioneer Med Sci. 2013;3(4). 16. Craig PS, Hegglin D, Lightowlers MW, Torgerson PR, Wang Q. Echinococcosis: Control and Prevention. Adv Parasitol. 2017;96:55-158. doi: 10.1016/bs.apar.2016.09.002. [PubMed: 28212791].